This NIOSH-approved particulate filter helps provide high efficiency respiratory protection against dust, mist, fumes, asbestos, radionuclides and radon daughters. Filter should be used with 3M(TM) Air-Mate(TM) Powered Air Purifying Respirator (PAPR) systems. Jaco Aerospace and Industrial is your one stop resource for 3M(TM) Air-Mate(TM) High Efficiency Particulate Filter, Respiratory Protection 451-02-01R01 1/cs and all of your 3M Products, Tapes, aerospace and industrial needs. 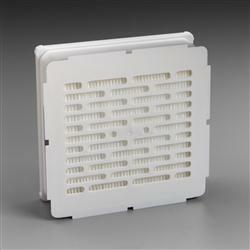 SKU Marketplace Product Description: This NIOSH-approved particulate filter helps provide high efficiency respiratory protection against dust, mist, fumes, asbestos, radionuclides and radon daughters. Filter should be used with 3M(TM) Air-Mate(TM) Powered Air Purifying Respirator (PAPR) systems.